Our Dota Auto Chess skills and abilities page contains a list of every heroes’ skills. A vital part of the strategy in Dota Auto Chess comes from building a strong team composition and adapting it to counter your opponents'. With so many pieces to choose from, Dota Auto Chess is a complex affair which requires substantial knowledge of hero trait bonuses and special abilities. Once you know what each hero is capable of though, you'll be better equipped to play with or against them. Abilities and traits aren't really listed in-game or otherwise, so to learn them all it's largely a case of playing the game until you learn them all. This means purchasing every unit and memorising what they do, which can be a pretty lengthy process. For new players that can be a daunting experience, and even those who've spent many hours in the game may not know what some heroes actually do. To make things easier, we’ve put together a list of each hero, along with their associated skills and abilities. We hope you find it helpful! This video by Weekly PC Games Supercut is immensely useful and showcases all of the abilities listed below. Do be sure to give it a watch. We'll update this page when more heroes and their abilities are introduced to the game. Keep this page bookmarked to stay on top of the game! Here’s a complete list of every heroes’ abilities. Anti Mage Mana Break: Burns an opponent’s mana on each attack. Mana Break deals 50% of the mana burned as damage to the target. Axe Berserker’s Call: Axe taunts nearby enemy units, forcing them to attack him, while he gains bonus armor during the duration. Bat Rider Sticky Napalm:Drenches an areas in sticky oil, amplify damage from Batrider’s attacks and slowing enemy reactions. Bounty Hunter Shuriken Toss: Hurls a deadly shuriken at an enemy unit, dealing damage and mini-stunning the target. The shuriken will bounce between any Tracked units who are within a 1200 radius of eachother. Clockwerk Battery Assault: Discharges high-powered shrapnel at random nearby enemy units, dealing minor magical damage and ministun. Drow Ranger Marksmanship: Increase attack damage and speed for Drow Ranger. Enchantress Nature’s Attendants: A cloud of wisps heals Enchantress and any friendly units nearby. Lasts 11 seconds. Mars Bulwark: Mars cannot perform any ordinary attacks. Whenever a physical attack from the front or side, Mars uses his huge shield to block a certain percentage of damage. Every once in a while, Mars will raise his shield to smash enemies in front of him, causing physical damage. Ogre Magi Bloodlust: Incites a frenzy in a friendly unit, increasing its movement speed and attack speed. Shadow Shaman Hex: Transforms an enemy unit into a harmless creature, disabling their attacks and abilities. Tinker Heat Seeking Missile: Launches 3 rockets to hit random enemies. Tiny Toss: Toss an enemy nearby, throw it to the farthest grid and stun. Tusk Walrus Punch: Tusk connects with his mighty Walrus Punch, a critical strike so powerful it launches its victim into the air. The victim is slowed upon landing. Beast Master Wild Axes: Beastmaster sends his axes flying and calls them home again, slicing through enemy units and trees along their path. Each axe can hit an enemy once, and amplifies subsequent damage from Beastmaster and his units. Chaos Knight Chaos Bolt: Throws a mysterious bolt of energy at the target unit. It stuns for a random duration and deals random damage. Crystal Maiden Arcane Aura: All allies’ mana regeneration increased. Furion Nature’s Call: Call a treant from a random tree around the chessboard. Juggernaut Blade Fury: Causes a bladestorm of destructive force around Juggernaut, rendering him immune to magic and dealing damage to nearby enemy units. Luna Moon Glaives: Empowers Luna’s Glaives, causing her attacks to bounce between enemy units. Deals less damage with each bounce. Morphling Wave Form: Morphling dissolves into liquid and surges forward, damaging enemy units in his path. Morphling is invulnerable during Waveform. Puck Illusory Orb: Puck launches a magic orb that floats in a straight path, damaging enemy units along the way. Queen of Pain Scream of Pain: The Queen of Pain lets loose a piercing scream around her, damaging nearby enemies. Slardar Corrosive Haze: Reduces enemy armor to amplify physical damage and provides True Sight of the targeted unit, revealing invisibility. Timbersaw Whirling Death: Timbersaw whirls extremely sharp edges, damaging enemies and destroying trees around him in an area. If an enemy hero is affected, it loses some of its primary attribute for a short duration. Whirling Death will deal bonus damage per tree destroyed. Treant Protector Leech Seed: Treant plants a life-sapping seed in an enemy unit, draining its health, while simultaneously slowing it. The seed heals friendly units around it. Pulses 7 times. Witchdoctor Paralyzing Cask: Launches a cask of paralyzing powder that ricochets between enemy units, stunning and damaging those it hits. Abaddon Aphotic Shield: Summons dark energies around an ally unit, creating a shield that absorbs a set amount of damage before expiring. When the shield is destroyed it will burst and deal damage equal to the amount it could absorb to an area around it. Removes certain types of negative buffs and stuns on cast. Lina Laguna Blade: Fires off a bolt of lightning at a single enemy unit, dealing massive damage. Lycan Transform: Lycan assumes his lupine form, gaining more HP and summoning 2 wolves. Mirana Sacred Arrow: Fires a long-range arrow with deadly precision to an enemy chess in another chessboard currently under attack/defense from friendly chesses, dealing damage and stunning the target. Damage and stun duration increase with range. Omni Knight Purification: Instantly heals a friendly unit and damages all nearby enemy units. Phantom Assassin Coup De Grace: Phantom Assassin refines her combat abilities, gaining a chance of delivering a devastating critical strike to enemy units. Razor Plasma Field: Releases a wave of energetic plasma that grows in power as it expands, but also zaps on contraction, slowing and dealing damage to enemy units caught in its path. Damage and slow increases with distance from Razor. THE Plasma Field hits each unit twice, once each direction. Riki Smoke Screen: Throws down a smoke bomb at Riki's current position, silencing enemies within 2 grids and causing them to miss some of their attacks. Sandking Burrowstrike: Sand King burrows into the ground and tunnels forward, damaging and stunning enemy units above him as he resurfaces. Shadow Fiend Requiem of Souls: Shadow Fiend gathers his captured souls to release them as lines of demonic energy. Units near Shadow Fiend when the souls are released can be damaged by several lines of energy. Any unit damaged by Requiem of Souls will have its movement speed and attack damage reduced. 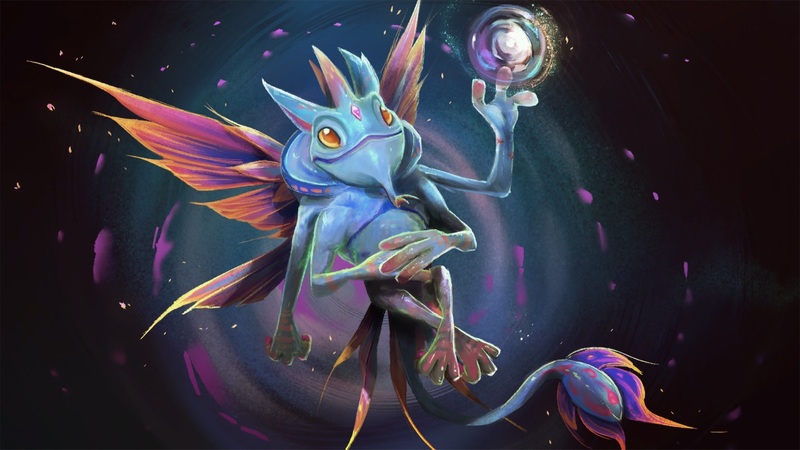 Slark Pounce: Slark leaps forward to the back of the first enemy chess he connects with, dealing physical damage to the target and disarming the victim. Sniper Assassinate: Sniper locks onto a target enemy unit and, after a short aiming duration, fires a devastating shot that deals damage at long range and mini-stuns the target. Terrorblade Metamorphosis: Terrorblade transforms into a terrible form and deals ranged damage. Venomancer Plague Ward: Summon a plague ward to attack enemy chess pieces. Viper Viper Strike: Viper slows the targeted enemy unit’s movement and attack speed while also dealing poison damage over time. The slowing effect reduces over the duration of the poison. Wind Ranger Powershot: Windranger charges her bow for up to 1 second for a single powerful shot, which deals more damage the longer it it charged. The arrow damages enemies and destroys trees along its path. For each enemy that Powershot hits, its damage is reduced by 20%. Alchemist Chemical Rage: Alchemist causes his Ogre to enter a chemically induced rage, reducing base attack cooldown and increasing movement speed and regeneration. Disruptor Static Storm: Creates a damaging static storm that also silences all enemy units in the area for the duration. The damage starts off weak, but increases in power over the duration. Doom Doom: Inflicts a curse that prevents an enemy Hero from casting spells or using items, while taking damage over time. Dragon Knight Elder Dragon Form: Dragon Knight takes the form of one of three powerful elder dragons, increasing his speed, and Dragon Tail’s range, while granting him new powers. Level 1 (Green Dragon - Corrosive Breath; attacks deal 20 poison damage per second for 5 seconds), Level 2 (Red Dragon - Splash Attack; attacks damage all enemy units in a 300 radius for 75% damage, with Corrosive Breath added to the targets), Level 3 (Blue Dragon - Frost Breath; slows movement speed by 30% and attack speed by 30 of enemy units in Splash Attack range for 3 seconds, with Corrosive Breath added to the targets). Kunkka Ghostship: Summons a ghostly ship that sails through the battle before smashing apart, damaging and stunning all enemies caught near the wreckage. Allied heroes touched by the Ghostship are given a swig of The Admiral’s Rum, receiving bonus movement speed and a delayed reaction to incoming damage. Lightkeeper Illuminate: Channels light energy, building power the longer it’s channeled. Once released, a wave is sent forth that deals damage and gives vision in its path. The longer it is channeled, the more damage is dealt. Lone Druid Spirit Bear: Summon a powerful spirit bear. Medusa Stone Gaze: Any enemy units looking at Medusa will have their movement and attack speed slowed. If 2 seconds of total time is accumulated looking at Medusa while Stone Gaze is active, that unit will turn to stone. Petrified units are stunned, and take bonus physical damage. Necrophos Death Pulse: Necrophos releases a wave of death around him, dealing damage to enemy units and healing allied units. Templar Assassin Refraction: Templar Assassin becomes highly elusive, avoiding damage and gaining a bonus to her damage. The damage and avoidance effects are separate, and have a limited number of instances. Troll Warlord Fervor: With each continuous blow on teh same target, Troll gains increased attack speed. If Troll changes targets, the stacks drop to zero. Death Prophet Exorcism: Unleashes evil spirits to drain the life of nearby enemy chesses. At the end of the spell's duration, Death Prophet is healed in proportion to the damage dealt. Enigma Midnight Pulse: Steeps an area in dark resonance, damaging enemy units based on their max HP. Gyrocopter Call Down: Call down an aerial missile strike on enemy units in a target area. Two missiles arrive in succession, the first dealing major damage and minor slow for 2 seconds; the second dealing minor damage and major slow for 4 seconds. Lich Chainfrost: Releases an orb of frost that bounces between nearby enemy units up to 6/9/12 times, slowing and damaging each time it hits. Techies Explosive Bomb: Plant a bomb that will automatically explode after a short delay dealing large amounts of damage. 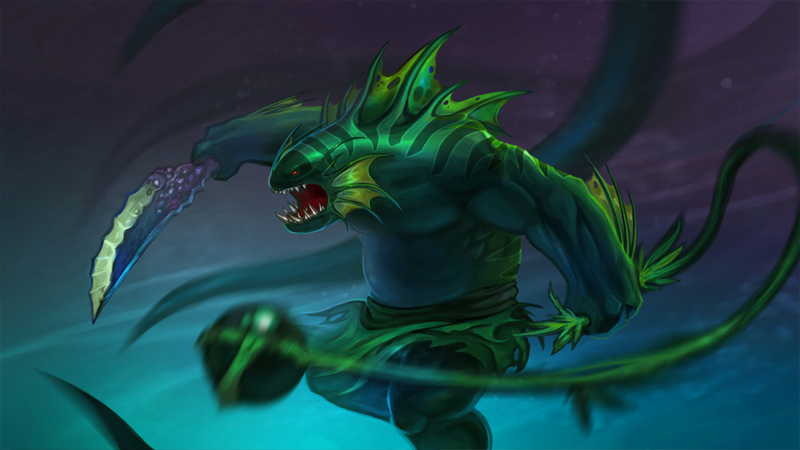 Tidehunter Ravage: Slams the ground, causing tentacles to erupt in all directions, damaging and stunning all nearby enemy units. Zeus Thundergod's Wrath: Zeus strikes all enemy pieces with lightning, no matter where they may be, upon cast, every enemy piece will have 50% chance to get hit. Each hit deals fixed magic damage and damage proportional to their current health - it is guaranteed to hit at least 1 target even if all units fail 50% chance.